The volume map shows the locations of images on a world map. button appears in the sidebar of the volume overview. Click this button to view the volume map. 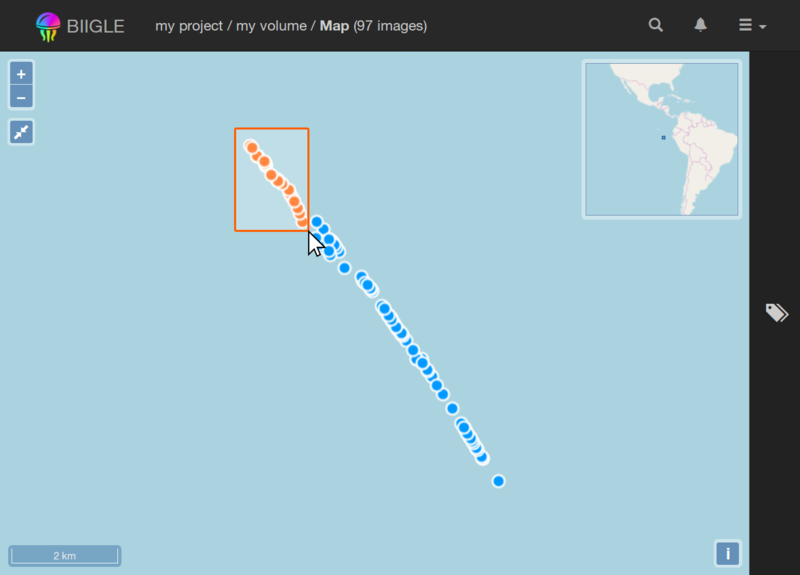 The locations of the images are displayed as dots on the map. Grab and move the map with the cursor to pan around or use the mouse wheel to zoom. Use the button to fit the view back to the viewport that shows the locations of all images. button. Now select a label from the label trees. The displayed locations will immediately update to show only images that contain annotations which have the selected label attached. You can also select multiple labels at the same time. 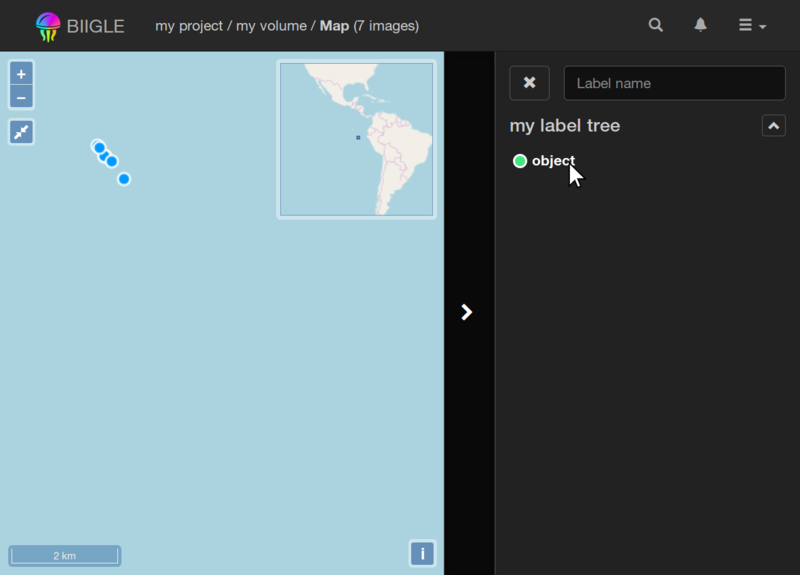 The map will show the locations of images where any of the selected labels occur. filter tab of the volume overview. Then select image locations on the volume map by drawing an encompassing rectangle. To do this, press and hold Ctrl as well as the left mouse button and move the cursor on the map. Release the mouse button to finish the rectangle. You can also select individual locations with a single click or add locations to an existing selection with Shift and a single click. Once there are selected image locations on the volume map, the volume overview will be immediately updated. 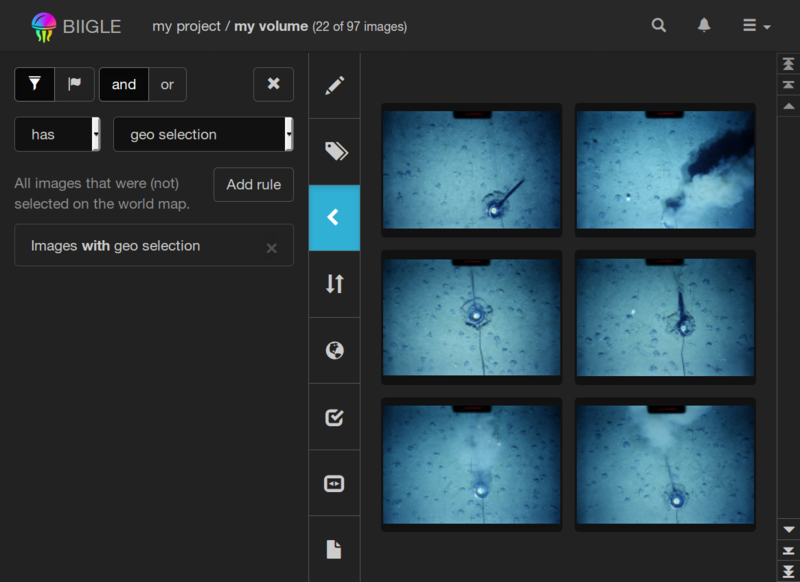 You can use the geo filter in a "link and brush" way if you display the volume map and the volume overview side by side in two separate browser windows.